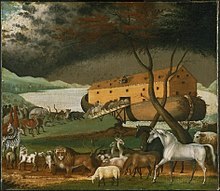 "God gives Noah detailed instructions for building the ark: it is to be of gopher wood, smeared inside and out with pitch, with three decks and internal compartments; it will be 300 cubits long, 50 wide, and 30 high; it will have a roof "finished to a cubit upward", and an entrance on the side." Collaget är monterat på ett blått ark. Die Collage ist auf einem blauen Bogen montiert. De hade byggt en ark som skulle sjösättas snart. Sie hatten eine Arche gebaut, die bald zu Wasser gelassen werden sollte.